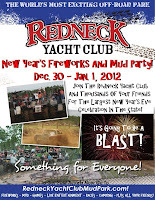 Redneck Yacht Club in Punta Gorda, Florida, is hosting what they are calling the largest New Year's Eve celebrations in Florida - the New Year's Fireworks and Mud Party from Friday, December 30 - January 1, 2012. Bring your mud buggies, ATVs, trucks or other off-road toys to the mud park for a weekend of mudding, truck pulls, racing events, live entertainment, mudding games and a fireworks show. Redneck Yacht Club contracted Garden State Fireworks for the show, so you can expect it to be big! Gates open Friday at 12 p.m. and close Sunday at 4 p.m. Advance tickets are on sale now. If you purchase by December 26th, you can save $5. Active military and vets receive 50% (must present DD214, VA Health card, or Military ID and be purchased at the gate only). Jeep has announced a special-edition custom Jeep Wrangler Call of Duty: MW3 model, that will hit dealerships across the nation in December. Built from the Rubicon, this custom Jeep has off-roading in mind, with features including Dana 44 front and rear lockers, a winch-ready Mopar front bumper and steel Mopar Rock Rails, all sitting on 32-inch BFGoodrich Mud-Terrain tires. The custom Jeep also features a power-dome hood design that is a first for any Jeep model, and underneath is a 3.6L Pentastar V6 engine with 285-horsepower. The Call of Duty: MW3 theme is carried throughout, starting from the outside with a choice of either black or bright silver metallic paint, Call of Duty Elite badging on the right and left fenders and on the spare tire cover. The interior headrests and rear cargo mat also include the Call of Duty logo. Jeep has the MSRP starting at $25,545, but tricked out with more features you could pay an MSRP starting around $40,000. For more information, visit the Jeep website. Get ready Florida mud boggers, Triple Canopy Ranch's 3rd Annual Christmas Toys for Tots mud bog is just 10 days away, starting Friday, December 9th through Sunday, December 11th. Everyone will receive a raffle ticket at the gate for a chance to win prizes including a family vacation to Westgate River Ranch, Warrior Dash passes, an annual pass to Triple Canopy Ranch, Archery Shop bow and more. Additional raffle tickets will be given away for those that bring an unwrapped toy to donate to Toys for Tots. Their goal is to help them fill a semi-truck, so let's help them help children have an amazing Christmas! Racing will start at the main mud pit at 11 a.m. on Saturday, which includes ATV races, 1-ton class races and 2.5 ton class races, with up to a $3,000 purse. And of course, all of the mudding will be followed up with a live concert at the Party After Dark on Saturday night. Tickets are only $25 dollars for a weekend pass if purchased in advance from on of the participating locations (you must purchase before 12/6), and are $40 at the gate for the weekend, or $30 for a day pass. 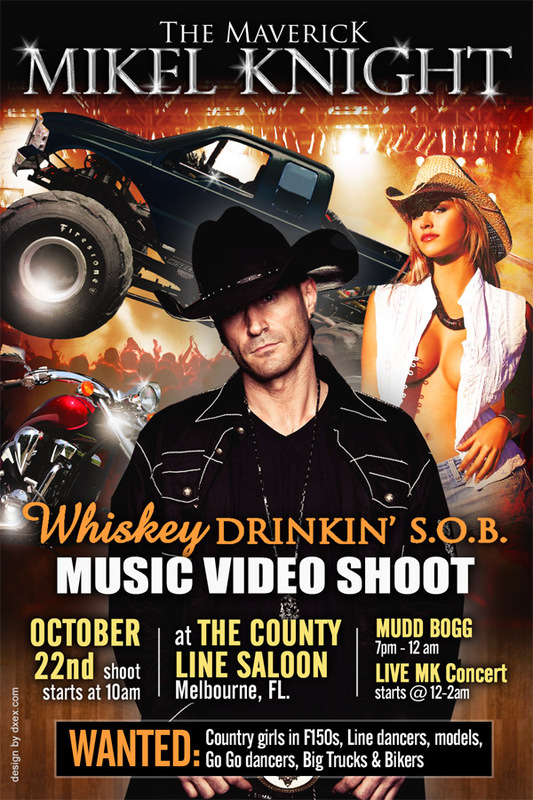 Country rapper Mikel Knight will be shooting his music video for "Whiskey Drinkin' S.O.B" at the County Line Saloon in Melbourne, Florida, on Saturday, October 22nd. The shoot - which happens to be the same weekend as Triple Canopy Ranch's Roots N' Boots - starts at 10 a.m., and will be followed by mud bogging at 7 p.m. At midnight, he takes the stage to perform a live concert. Mikel Knight's album "Country Rap King" which was released in July 2010 has other popular country rap hits such as "Saddle Up Shawty" and "Welcome 2 the Rodeo". This stop marks just one of several remaining across the country on his Back in the Saddle Tour, including Tennessee, Alabama, Louisiana, Michigan, Arizona and more. For the full tour and more information about his concerts and other music video shoots, check out MikelKnight.com, or preview the album in iTunes. If you are looking for other country rap artists, be sure to check out our mud bogging music mix post from earlier. Spend your halloween weekend mud bogging at Horse Hole Creek's Truck or Treat Saturday, October 29 through Sunday, October 30th in Inglis, Florida. The event will feature family-friendly halloween-themed activities, including a pumpkin carving contest, games, trick-or-treating around the mud hole and a contest to see who has the best decorated campsite. Saturday night, the party begins with live entertainment, costume contests for adults and a haunted hay ride for children. Of course, there will also be plenty of mud bogging, including games Follow the Leader and Money Bags. Horse Hole Creek will open their gates Saturday at 7 a.m. and close on Sunday at 6 p.m. Weekend passes for both days are $30 or day passes are $15. There is a coupon for $1 off you can print from the event's website.